Randell and me near the Bridge to Canada. The St. Clair River is behind us. Last week I kidnapped my husband for a little surprise trip to the greater Port Huron area. 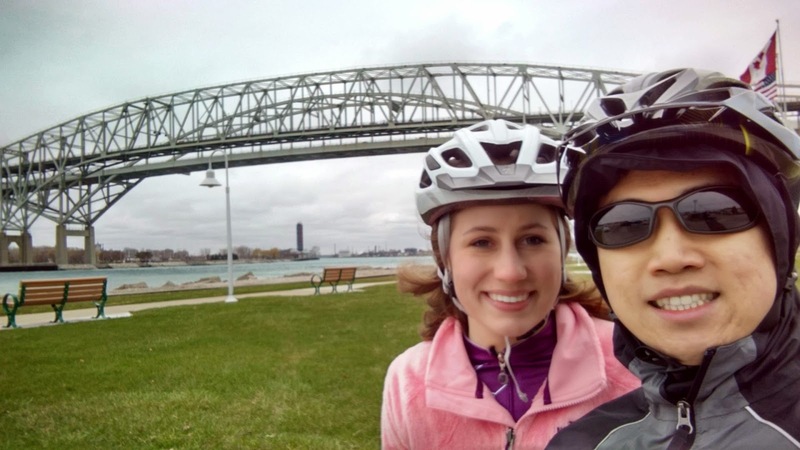 We stayed at two adorable Bed & Breakfast establishments and biked the Bridge to Bay trail along the Lake Huron and St. Clair River shorelines. Along the way down the trail, there were portions of scenic paved bike trail, sections of riding on the wide shoulder of the road, and parts where we had to ride on the sidewalk because there was no room on the street. It was on this last part of the trail that the incident occurred. We were rounding the corner on the sidewalk in an adorable neighborhood, and we saw a lady walking her cute little white fluffy dog up ahead. I told Randell I thought we were supposed to walk our bikes around pedestrians, but he said we'd be okay; she was making room. I insisted, "No, I really think pedestrians have the right of way. I think we should get off; it's the right thing to do." So we stopped and got off our bikes. At least I tried to get off my bike. As I lifted my foot to bring it over, it didn't quite clear the center bar. My ankle caught the bar, and I toppled... in the direction of the street, with oncoming cars. Praise God for that little patch of grass between the sidewalk and curb. As I sat there, throbbing ankle and all, smiling to let the slowing cars know that I'm just fine, the dog lady asked my husband in passing, "Is she okay?" "Yeah, I think she's fine," he replied, and she kept walking. I got up and gingerly wiggled my ankle to make sure nothing was broken, then walked my bike the rest of the way down the street. I thought to myself as my ankle complained with every step, I went to all that bother, to the point of injury and humiliation, to get off the sidewalk for you, lady, and all you can do is ask casually if I'm okay and keep walking? And you don't even ask me, you ask my husband? As I thought about this humorous accident later in the week, I realized it had some parallels with a passage we looked at recently in our series on Hebrews at church. Just as I went out of my way to be courteous to the woman on the sidewalk, God calls us to "make every effort" (NIV) to be at peace with everyone. That's a tall order. Sometimes the people we think are traveling with us on the journey of peace will either refuse to respond to others peacefully or will not feel called to respond in the same way Christ has called you or I to respond. My husband felt like we could share the sidewalk with the lady and her dog, but I felt compelled to get off my bike and walk. 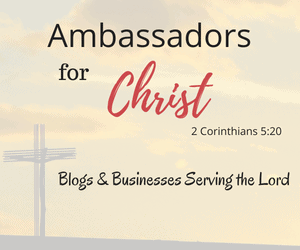 Even your closest companions will sometimes differ in this area, but we are stilled called to do what we feel God has called us to do. People will not always (actually, they will rarely) appreciate the effort you put into living at peace with them. The dog walker seemed to disregard the energy and pain I expended to get out of her way. While I didn't expect her to bend over backwards for me, I realized that often we just have to do the right thing with no thanks or applause. Finally, striving for peace will sometimes mean we get hurt. Our hearts must be invested when we deny ourselves the typical reaction of anger or defensiveness and choose to be peaceful. Some people will shame us because of it. Many will wonder why we don't stand up for ourselves or seek justice or vengeance. We may lose valued relationships. But the way of peace is a way of self-denial, and self-denial in this world usually means some level of pain. 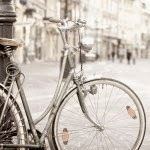 I experienced the pain of self-denial when I chose to get off my bike for the lady and her dog and ended up falling over and bruising my ankle. The wounds of peace-making are much deeper and longer than my little scrape in Port Huron. Yet we can rest in the truth that our God knows the good we have suffered for and the peace for which we strive. He is always journeying with us on the way of peace into the places even our friends dare not go. He will always acknowledge our effort with, "Well done," and He will heal the pain with His grace.